Several years ago my friend had a flatmate who, over a period of months, slipped into a deep, unshakable depression. In this time she stopped washing, going to work, or doing anything much really… apart from playing World of Warcraft. You could go round at any point and she was guaranteed to be in her set place on the sofa totally engrossed in “the game”. Nothing could disturb her, and nobody knew what to do about it, until the rent got too much and she dropped out of everything entirely, left the city and returned to her parents. None of this was anything to do with World of Warcraft, of course, but it does go part of the way to showing its incredible escapist draw. When Blizzard Entertainment released World of Warcraft (WoW) on 23rd November 2004 a whole new online phenomenon was born. Now, after just shy of a decade, the company has released an infographic which shows an incredible 100 million people have played the game in its lifetime. This is equal to twice the population of South Korea and these players have come from 244 countries and territories. In 2012 Business Insider reported that it was the highest grossing video game ever. At over $10 billion it beat “Call of Duty: Black Ops” hands down (this made $1.5 billion). In fact, in ten years this game has proved so insanely popular that it has generated an awful lot of commentary… both positive and negative. Cliff Dennett, CEO of SOSHI Games says: “World of Warcraft is a classic example of something that companies have spent years trying to perfect”. Picture “virtual project teams, from multiples cultures and in many countries, who have never physically met, collaborating, working on complex strategic and tactical problems, in real-time, using an IT system”. “Now, in this context it’s an online game, and the challenges are typically ‘Let’s take the castle and kill the dragon’ but they could equally be a virtual team to work out how to ‘knock a competitor out of a market’. The point,” he continues, “is that something has made these people work together collaboratively”. “Of course, it’s fun, but it just indicates that the world of gaming has something to offer businesses in the design of their IT systems and business processes. We need to sprinkle a bit of what makes this fun onto business IT and processes”. It is true that bringing global collaboration in the workplace should indeed make jobs more fun and efficient. 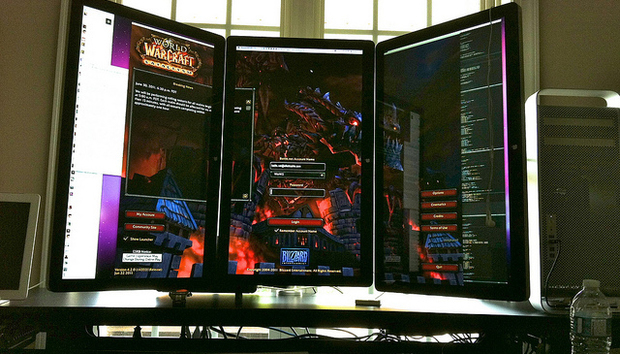 But what is striking about World of Warcraft is the sheer level of addiction it generates. The fact that it offers a whole new alternate universe makes it a perfect getaway. Elliott Rodger, the misogynist gunman who killed six people in Isla Vista at the end of May before shooting himself, produced a huge (over 100,000 words) manifesto which spanned his 22 years of life and tracked a full obsession with the game. He described his first use of online gaming as “one of the best experiences of my life”. And other issues aside, this is a recurring theme through the entire text. “The ability to play video games with people online temporarily filled the social void,” he said. He became very addicted to his character: “It was all I cared about”. He charted a bizarre stop-start obsession in which he’d force himself to stop playing. Of his 19 year-old self he wrote: “After two weeks of playing WoW non-stop I once again came to the abrupt decision to quit.” He continued: “More and more ‘Normal’ people were starting to play the game. The evils of the world had followed me”. This theme of escapism, or not, from real life was seconded by a lady from the US who dropped me a note in regard to an article we published on the subject of bullying. She told us: “I started to play World of Warcraft in October of 2007. I quickly grew to love the game. Recently, I hardly play due to bullies in game”. Her story comprised of threats and sexual harassment. This began with a couple of comments from two real-life brothers who played together in the game: “He would say awful things to me that really got to me. Then, it escalated. He said his main goal was to make me quit WoW. He also said that he hoped I die and he wants me to die”. The matter of online and offline personas continued as she added that she had done some digging and: “One woman posted that someone had put her phone number, email, place of work, the town she lived in out in trade chat and she started to get harassing phone calls, death threats on herself and her children who also played WoW. She said that she was quitting WoW and pulling her children out of the game as well and cancelling all accounts”. “World of Warcraft was very simple to use when it came out,” says Nathan Hester, a programmer at SOSHI Games, “far simpler than other similar games and this made it far more accessible to get into quickly. Even 10 years ago, the internet had started distracting people’s attention and people needed very simple, obvious interfaces and ways to get into something”. “It had a more ‘toony’ feel to it than other games of the time,” adds Sean Butler, another SOSHI Games employee, “this brings it more into the mainstream and out of the arguably more geeky world of other MMOs at the time”. “I think [this game] shows how the internet has become a powerful place to collaborate,” concludes Cliff Dennett. “Whether you are engaged in a largely entertainment-based activity such as online games, social networking or using corporate-based business software, the power to collaborate and communicate is significant now”. World of Warcraft is certainly a phenomenon. It proves just how big an online community can become and reveals just how effectively people can collaborate together over wide distances, if they want to. It also provides a sneak peek into a sinister alternate reality… when people are finally given the chance to escape.